Planning a trip to the US? The country sure has a lot of things to offer for both locals and tourists. But before booking that flight, here are a few things that you need to know, especially if you’re an Australian. 1. If you’re from Sydney, take a direct flight to Los Angeles. There are countless of exciting things that you can do in this city. Universal Studios is a must-visit. If you like the beach, drop by Santa Monica Bay. You won’t be disappointed. 2. Mexican food in Australia isn’t that good, but it’s surprisingly really delicious in the US. Most of the bad food tastes better in the US. Make sure you grab some to get a taste of it. Ribs and barbecue are a must-eat. 3. If you’re into adventure parks, try to visit Disneyland. The park is a family-oriented place full of exciting rides and shows. It can be a little crowded at Disneyland so plan your trip ahead of time to avoid long lines. 4. Holidays in America include Black Friday which is the day after Thanksgiving. A big sale to officially welcome the Christmas Season happens on this day. Don’t miss it to take advantage of the biggest discounts on lots of items. You can even shop online during Black Friday too. 5. Americans are so into sports. When you get to visit, watch at least one big sporting event like the NFL or the NBA. I’m sure you’ll enjoy it. You might even spot some celebrities during the event. 6. Australians don’t tip, but Americans do. Tip the bell boy in your hotel, or that waiter at the restaurant. But no, you don’t have to tip at Starbucks. 7. When shopping, the price tag isn’t what you’re going to pay. Unfortunately, it doesn’t say how much you will be paying for taxes, so expect to pay extra. 8. 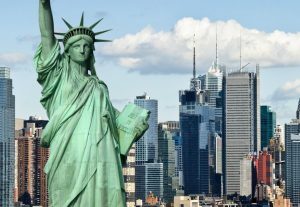 Experience New York City by seeing The Statue of Liberty, sipping their good coffee, talking with the locals, and exploring downtown New York. 9. Don’t forget to apply for an ESTA. While Australians don’t need specific visas for traveling not more than 90 days, they still need an electronic approval via the ESTA. It’s the Electronic System for Travel Authorization. Don’t worry, it won’t take long. There’s just a fee of about $14. Traveling to another country is rewarding and exciting. However, careful planning is needed. Make sure you take these tips to heart to enjoy your vacation in the United States.